Prequel: Hayate no Gotoku!! : Atsu ga Natsuize - Mizugi-hen! Hayate no Gotoku! (or Hayate the Combat Butler if you prefer) is a manga created by Kenjiro Hata which is currently still ongoing. It has already received an anime adaptation by SynergySP which ran for an impressive full year with 52 episodes. A year later, and under a new animation studio, Hayate no Gotoku!! is the sequel to the popular parody-comedy, romance series. + As a parody-comedy there isnt really much of a plot, however this season is a near perfect adaptation from the original manga. - Without the fillers of season 1, the amount of anime/manga references presented in season 2 has dropped significantly. Those who watched the series mainly because of those might feel disappointed. + Highly superior color palette compared to the first series. + JC Staff knows how to make characters look cute, and this show is testament of that. + More details in the backgrounds, and did I already mention the amazing color palette? - Although better looking, the animation quality can get iffy at times. - In terms of consistensy, season 1 was better. + The voice cast for this show is so fantastic, everyone plays their role amazingly well. + The Background Music for certain scenes are great to listen to and really make some scenes waaaay better. + Characters that didn't shine much first time around get to show their characters more, and they are all great! + A lot of character development in this season really makes some characters grow as we learn more about them and their past. LOVE IT!! This season was IMO so much more enjoyable than last time due to the fantastic interaction between characters, and also for introducing (or mentioning) characters and events that will later on in the story be important. I have to admit im sad this was only 25 episodes seeing how the manga is almost 100 chapters ahead and there is soooo much more material left to cover. Also the last episode might have given us a small taste at things to come in the future (season 3 should be a given) JC STAFF YOU BETTER DELIVER!. 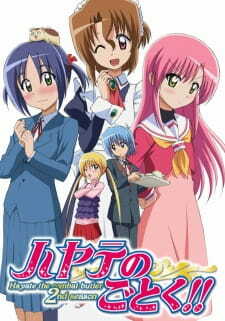 In the end regadless on what it is that made you enjoy the first series, Hayate no Gotoku!! is a fantastic sequel and also a fantastic adaptation. It still has high quality humour, fantastic and very likeable characters, and most importantly...its just fun to watch. If you have never read the manga it is required to have watched the first season (the first half at least) in order to start this season, however I am confident that there will be more seasons to come and if JC Staff can keep up this level of quality, I know that in the future there will be more laughter and entertainment to come from this series. Down to brass tax: the story has, outright, abandoned the "Hayate owes 150 million yen" arch. True, it keeps him as the butler to Nagi, but, compared to the first season, it's not the driving factor - the relationships are now. If you saw the prequel to the second season, the OVA, you would have been slightly shocked with, not only with the art style, but with the more relationship-oriented season that is to come. For example, Hayate makes only one reference the entire OVA to the fact that he owes 150 million yen, this translates rather proportionally to the amount of the "debt story arch" you'll be receiving in the second season. If you came to see the conclusion of Hayate's triumphant victory over his insurmountable debt, stay at the door. If you came to have fun with the relationships, triangles, and awkwardness, I saved you a seat. The majority of the episodes are geared towards one of Hayate's female suitors (if we're calling this a harem). Now, I say most are, some episodes are rather needless and, frankly, there are a few I could care less about, but the longest "new" story arch that you will see will last for approximately 2 episodes in length. 7/10. Ohhhh, boy. The second best part of the series was the sound. I liked the theme, and every time I sensed myself getting a little fed up with the current theme, it was like they read my mind and it was changed the next episode. Every opening/closing was fresh and upbeat - much like the show is. Second, voice acting. You can't get much better than the two voice actors of Maria and Hayate. No, sir. You cannot. Maria, as we know is rather reserved and pensive and her voice reflects that as clear as undisturbed water. Hayate's voice in full of ignorance and apprehension, but it also full of innocent power. Great job to especially these voice actors, but to all who participated in the show. 10/10. HINAGIKU ASSAULT. Be ready for it. Trust me. Huge character development on the part of Hinagiku would be an understatement. Albeit she is given a FAIR SHARE of screen time and another crucial development takes place which I'm sure you saw prefaced in the OVA, possibly even in the first season as well. Ayumu is the only other standout character with her development and role that she takes on in the second season: more mature and, I found her, very profound and insightful. The majority of the other characters remain vastly the same. Hey, if ain't broke, don't fix it. 8/10. My enjoyment partially played into the fact that the show gave me what I was looking for after the first season: an identity. In this season, we saw that it had settled into a romantic comedy identity and spruced it up with a few action bits, but not as much as the first season. 8/10. To me, this was a wise decision. You can't have an anime that's solely based on comedy and have all these extremely powerful personalities behind it, because the characters will seem like they're forcing it and being too fake. Thankfully, the romantic comedy aspect was brought to bear, and the "strong personalities" were satiated, tamed, and, most importantly, and garnered success. The show still maintains its comedy and it's the length of the second season has been halved to 25 episodes, but the affect the storytelling leaves on you is as substantial as the first: it's very funny, makes impossible-to-get-every-single-reference references, good characters, a reasonable plot, good sound, and as entertaining as any other anime out there. 8/10. Hayate no Gotoku!! is a unique parody and slice of life series that mainly focuses on the relationships between characters. It features some of the funniest and most ridiculous characters that one could find, which is the primary reason it is so entertaining. I for one am very proud of J.C. Staff for sticking to the source material. While at times an episode could seem rigid and have poor flow from the first half to the next, seeing chapters from the manga coming to be animated brings a feeling of joy. The art however leaves something to be desired. The change of color and designs of the characters from the first season and is not welcome. The backgrounds are fine but Nagi's hair looks like it was drawn with a piss yellow crayon, and Hina's and Ayumu's hair just screams QUALITY. But this is to be expected from a studio such as J.C. Staff, and it doesn't help that Japan's economy isn't so hot at the moment. The sound enriches the episodes, and is the reason why this anime is worth watching if one already currently reads the manga. The seiyuu are all outstanding at their roles and the background music fits in perfectly with each scene. The characters are extremely witty and endearing. The sheer amount of them and the developments between them is what makes Hayate so entertaining to watch. "Hayate no Gotoku", season two is definitely a graphical improvement on the first. I'm not saying that the animation from season 1 is bad, I'm just saying that the new animation is an upgrade from the original. ...Anyhow, the second season is more of the hilarious fun that we know and love. All the characters have returned with full force, bringing with them more aspects of their personalities which were seen in the manga version. A definite plus in my opinion. This time the focus isn't set as much on Hayate's debt as it is the slight romace that goes on between the characters (though Hayate still isn't able to tell if a girl is hitting on him. Good ol' ignorant Hayate.) One of the characters that the season seems to focus on most is Hinagiku, and how she realizes a new fact about herself. Also, this season does NOT pick up after episode 52 of season one. No, this season takes place right after episode 25, helping keep a stronger closeness to the manga. This series is one that I recommend to people young and old alike. If you like comedy, want a romance show, or just plain ol' want to watch something different yet familiar, this is a show for you. It's said that the best way to judge an anime girl’s social status is through her hairstyle. If she has hair drills, then you can assume she's rich! But what exactly are hair drills? Come find out about this iconic hairstyle, as well as meet the classy anime girls who made it famous!